Beautiful! 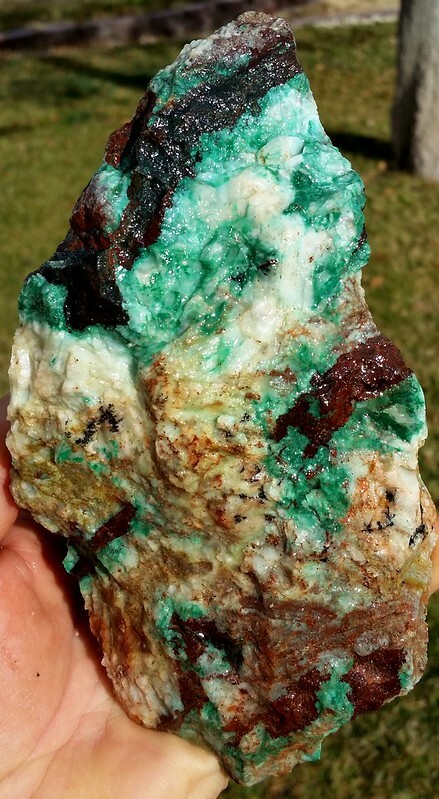 You keep putting pictures of these copper ores up and I keep drooling! Your C/O rough is very interesting. How do you pre-form and cab the material? Do you use any steel diamond wheels, or nova's, or expandos with S/C belts? I have some of these C/O pieces myself, and I have never took the time to figure out what works best. What do you use for a polish, if any? I live in AZ and C/O is rather plentiful around here. Keep up your posts, please. I find them to be extremely interesting and they give me new ideas! Thanks! 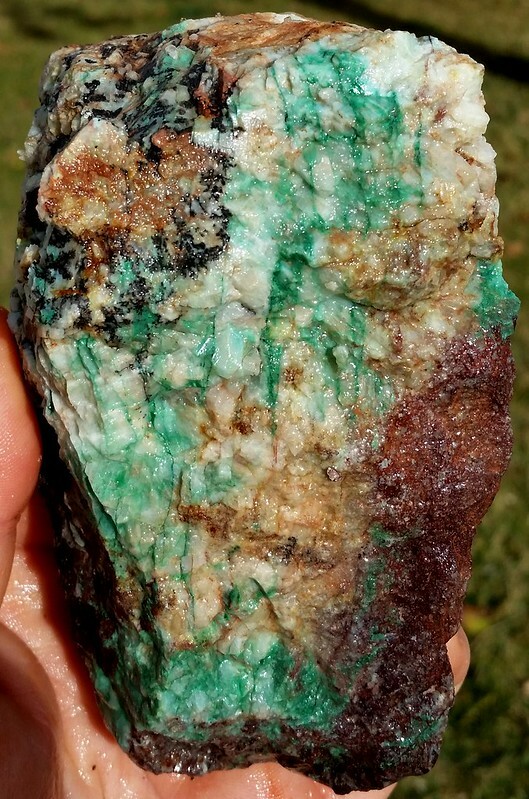 The material has a lot of dolomite and some calcite in the matrix along with quartz, limonite and of course the copper minerals. So it is not hard like jasper. 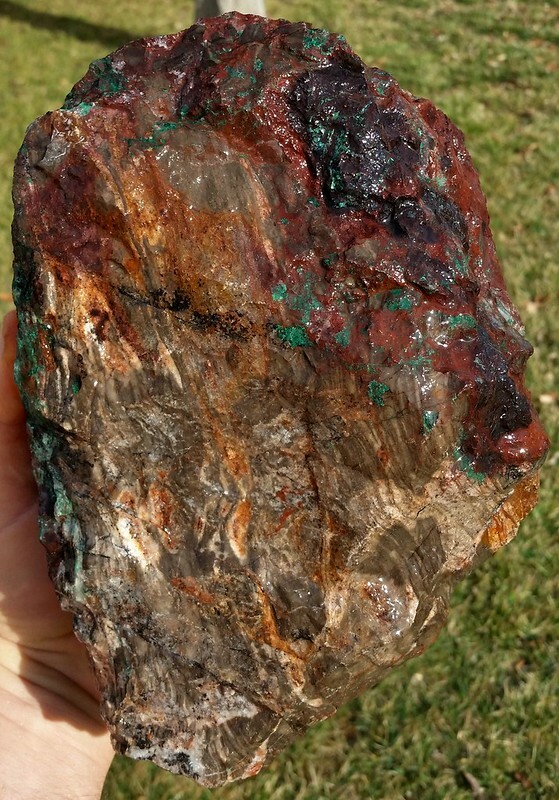 I cut the copper ore with water using a slab saw, tile saw or trim saw depending on the size of the rough. I don't like to use oil with softer stones. 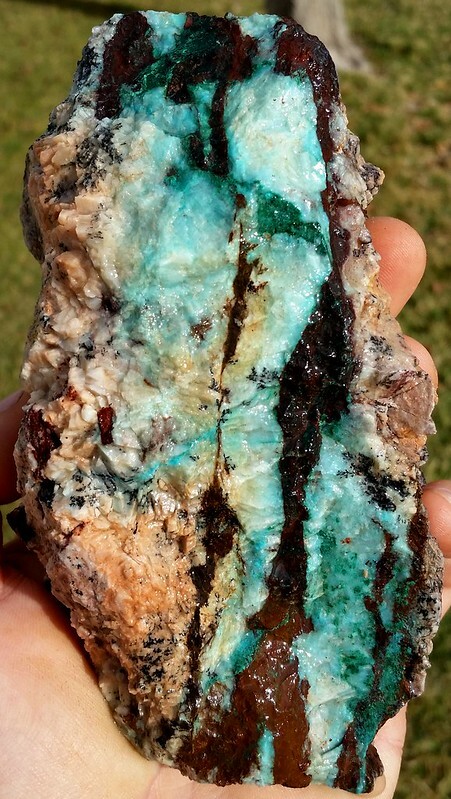 If silicated chrysocolla then I usually cut with oil. A lot of the pieces, especially end cuts I do not pre-form, I just free-form the pieces grinding away any too thin or otherwise bad areas then deciding the best shape to maximize the stone. For slabs I have templates that I draw my pattern with then use the trim saw with water to cut. The cabbing machine is an old Genie with NOVA wheels, although I have belts I refurbish the wheels with when needed. Some of the material takes a really nice polish just using the cabbing machine wheels. If not then I buff them with a little Zam. Going to experiment with some other ideas to get a higher polish such as finishing up in a vibratory tumbler . I found some very similar material not far from Reno. I was able to cut it into a few cabs. Took an okay polish. I have not checked out the copper mines near Reno yet. There is one near Pyramid Lake I read about years ago and wanted to go look for specimens. 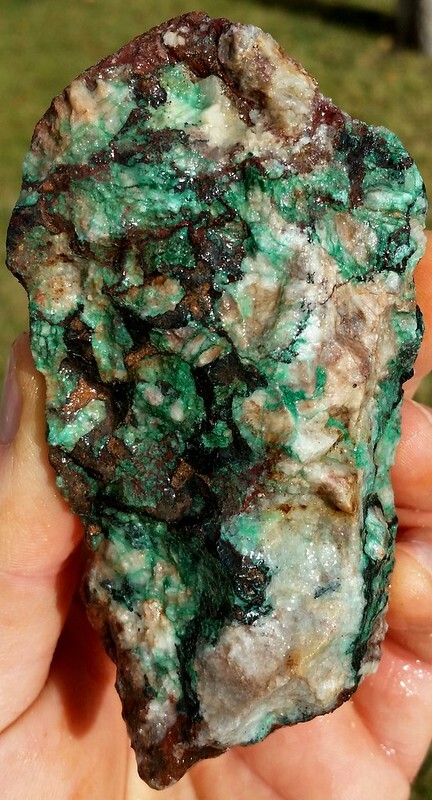 Cannot recall the name of the mine. Used to spend a lot of time at the mines in Virginia City down in 6 mile Canyon. Went back recently after not being up there in over 25 years and it has changed so much. The road is paved now, the trees matured and I cannot find my favorite mine anymore that I collected silver clay from. 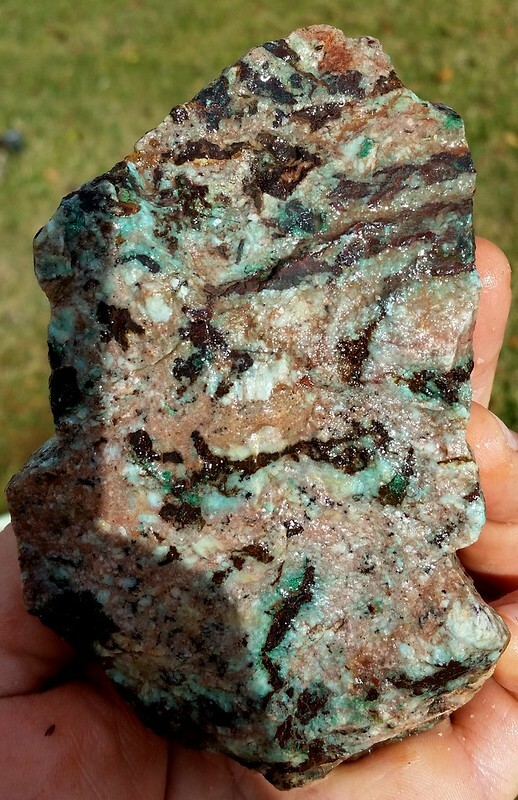 Found some small specks of what looked like turquoise in the rocks atop Slide Mountain when I was a little kid. Spent my summers in Reno on the Callahan Ranch so spent a lot of time hiking the mountains around there. The area used to be considered the Mineral Capital of the World in the old days when it was known as Ormbsy County, but I never found anything too exiting up there. The best collecting is between Beatty and Fernley. 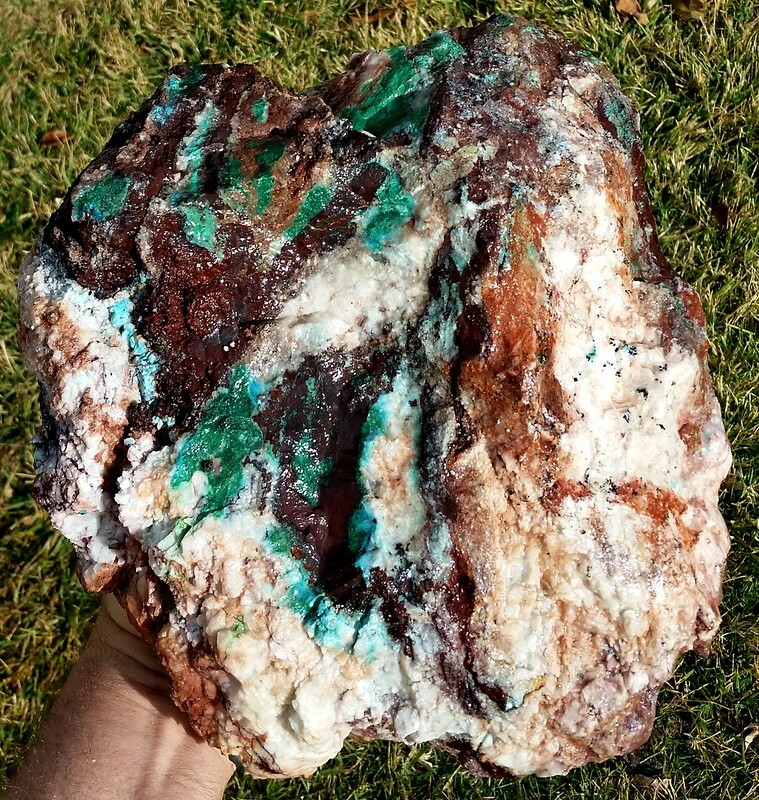 Just found some silicated copper ore near Coaldale Junction a few days ago coming back from Reno. Thanks James about how you cut, sand and polish C/O slabs. The ones I have are like yours, no elemental copper in them, just the tell tale blue streaking permeating through the stone. The configuration of how the blue silicate slips through the matrix kind of reminds me of boulder opal and how it threads through the stone. Do you stabilize your rough before cutting, etc? Thanks James. No, I have never had to stabilize any of it. There are occasional cracks since it was blasted out. But if it breaks I can still cab the broken pieces. And the material is hard enough to cab and polish.